One of the most intriguing iPhone XR pros (actually since iPhone 7) is that it comes out with a gorgeous 4K display with a ridiculous 806 pixels per inch that demands crisp and sharp images. Luckily a huge stash of full HD/4K resolution wallpapers are available for free download for your new iPhone. Don't know how to change wallpapers in iOS 12 or download background live photos for iPhone XR/XS/X/8/7? Follow the guide below and customize your HD wallpapers to make your iPhone XR, XS, XS Max, iPhone X/8/7 cooler. 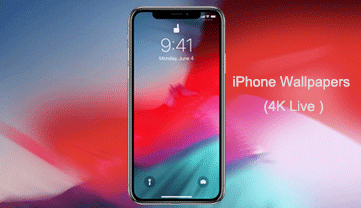 To set beautiful wallpapers as your iPhone XR, XS, XS Max background pictures, the boring and cliche default images built in the iPhone XR, XS, XS Max, iPhone X/8/7 is obviously far from enough. You can make it look more personalized by downloading some exclusive wallpapers (HD, animated) on your iPhone XR/XS/X/8/7/6S. A quick Googling can reveal a number of resources offering COOL and free wallpapers for iOS 12, like Poolga.com, iLikeWallpaper and more. All you have to do is select a site and go to download background wallpapers for iPhone XR/XS/X/8/7/6S/6S Plus as per the guide below. 1. Free download the pictures to your Mac or PC via your browser (Right click and Save as). 2. Sync it from your computer to iTunes. 3. Set the picture as the wallpaper for iPhone XR/XS/X/8/7/6S/6S Plus. For those who are reluctant to download images on computer, a variety of iOS apps are out there offering free background pictures. Go to iTunes can download an app, like 10000+ Wallpaper, Wallpapers HD (to name a few), which are good tools to improve your iPhone look with cool, funny, cut wallpaper in 100% HD. 4K Ultra HD live photos are crisp. But the problem is that they are larger file in size. So if your iPhone XR/XS/X/8/7/6S/6S Plus brims with numerous files, apps, music or videos, how much space left for your HD Live wallpapers? Have a check on your iPhone space first and then make some measure to free up its space. Honestly, to transfer iPhone files to computer as a backup and then delete them can be a feasible way to make room for iPhone. And you can resort to the cover-all iPhone transfer tool named MacX MediaTrans to reach your goal. It helps you backup and transfer photos, music, videos and other iOS data to your Macbook/iMac or Windows 10/8/7 so that you can delete the unneeded files on iPhone and save space on iPhone XR/XS/X/8/7/6S/6S Plus. The whole iPhone XR/XS/8/X/7 transfer process is dead easy, just a mouse click and the iPhone files can be saved on computer with a second. Let's admit it, it's far more awesome to use live animated pics than static ones. With iOS 12, iPhone XR/XS/X/8/7 Plus users can enjoy a cool feature of Dynamic backgrounds. Similarly, if you are not satisfied with the built-in dynamic ones, you can find external pictures to download. There is one more step. 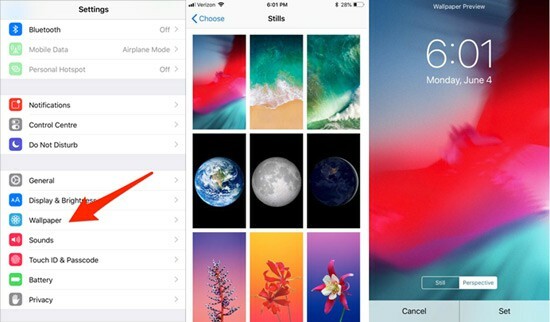 You will need to jailbreak your iPhone as Cydia released new apps iDynamic that can capture new photos that is dynamic on your iOS 12. Launch Cydia and download iDynamic, or Weatherboard. Launch the iDynamic app and you will find many 1080P HD dynamic wallpapers (both free and paid). Tap the image you like from the list. Then you can set it as your wallpaper now. Many users prefer to set their own shot photos as their wallpapers, like kids photos, cat images, nature pictures, etc. After you shot the photo, you can change it in iOS 12 and set it as your wallpaper. Certainly, you also can also download movies to iPhone XR/XS/X/8/7/6S/6S Plus and capture screen when playing movies to make your personal HD ones. If you need to reduce the size of your background pictures, you can rely on apps to do the task. To save your effort in seeking, two apps WallpaperSize Free and Wallpaper Fit are both reliable tools to re-size, rotate and zoom in your photos. 1. Make sure the image or dynamic animated file is on your Phone. Then go to Setting. 2. Tap Brightness and Wallpaper and go to Choose Wallpaper. 3. Tap the image you would like to set as your wallpaper for iPhone XR/XS/X/8/7/6S. (You can zoom in or adjust the photos). Then tap Set. 4. Choose whether or not set the background as your Lock Screen, Home Screen or both. 5. You will change it for iPhone now. If you want to transfer your wallpapers to computer for a vivid photo slideshow making, you can utilize the above mentioned MacX MediaTrans to do so and then open its sibling named MacX Video Converter Pro to make a photo slideshow video with these images for your special event use.